Today’s the day! The LittleBigPlanet 2 Move Pack will be available later today on the PlayStation Store refresh. The epic downloadable pack includes tons of new gadgets and tools, giving you the power to CREATE games for your PlayStation Move motion controller, which eventually means that tons of user-generated PlayStation Move-enabled games will be available to everyone for free via PSN. But most importantly, the Move Pack contains an epic new storyline titled “Rise of the Cakeling!” See what’s in store in our new Story trailer below. The LittleBigPlanet 2: Rise of the Cakeling Move Pack (add-on) will be available for $9.99 in the US. Note that you must have LittleBigPlanet 2 in order to play it. 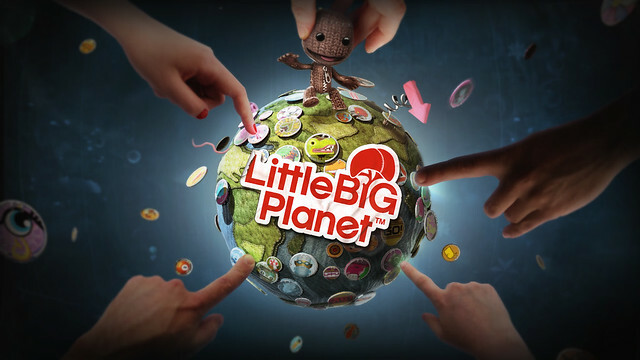 With LittleBigPlanet making its way to the PS Vita, we have lots to more features to share. Stay tuned as we highlight different features over the next few months. For now, check out this online interview with one of the members of Tarsier Studios – the team leading Sackboy’s charge onto the powerful PS Vita handheld system. Our epic community continues to wow us with new games and level creations. Below, check out some nuggets that we found over the weekend. And, as always, thanks to our creative creators for sharing these games…and to the fans that record these and post these online for all to enjoy. Epic sidescrolling shooter: Great work PSYNTENS! Our “forever fans” are still at it with a new podcast. Can’t believe you guys are on #137! Epic WIN! Question of the week: What’s your favorite Pop-it tool? Be sure to let us know in the comments below! wow, $9.99? Interesting to see the price finally announced, but a tad bit surprised that it’s going to be a full $10. though, Makes sense: This IS probably Media Molecule’s BIGGEST update to the game, after all! Can’t wait to try out the new Move Pack! Definitely the biggest, baddest and most…”moving” DLC to date. 5 levels, 7 side-games, tons of tools, Move Paint and new costumes. Personally, I love the material cursors, because building terrain is so much fun! Little Big planets are AWSOME!!!!!!!! I’ll be getting this “awesomely packed” DLC soon, by Thursday hopefully. hey if you didn’t know Gamestop has a SALE on MOVE controllers and Nav controllers 50% OFF. U can get both for $40. But I think you have to order threw there web site. Yup…what he said! Don’t forget you can now 3 players can play with the Move + Nav configuration. Good Move times ahead. does it also come in EU out tonight??? A little bit expensive… Unless it comes with 20 levels. Love LBP and LBP2, got several DLCs and costumes, but the problem with the online scoreboard is a shame. Months to fix this glintch and nothing… Only one response that they are in QA process of the fix. As it is now, no one can get a platinum trophie in the game. And the support needs to be more responsive with us. It seems that make money with new DLCs is more important than fix the online game. Can you play through all of the “Rise of the Cakeling” levels solo? Or do they require co-op, like “Prehistoric Moves” did? Yup, you can play these levels solo (but its more fun in co-op, as always). @9 You do realize that it could be two completely different departments within MM, right? This DLC could have been in the works since before they started working on the scoreboard thing (most likely), and it could be two completely different teams on each subject. MM is big enough to do that. Just give them time to work it out instead of blaming them for your dissatisfaction. Also, once a DLC packet is complete, it becomes mostly out of the creators hands, so if anybody is to blame for making MM look greedy, its Sony’s PSN Store Update Dept. I understand that MM is pretty much an internal part of Sony, but its also mutually exclusive as well. @ItsNymo: This really is the biggest patch to date by far. All other patches and updates to the game have ran at the largest a little below 100 MB. This patch was 568 MB. This pack and the patch affiliated with it is a HUGE change to the game. @zombie9: That Gamestop deal also extends into the stores. Apparently the 50% gets taken off at the time of purchase. This is a FANTASTIC deal for anybody that doesn’t have a Move or Nav yet or just for those people looking to pick up another. Don’t worry guys, when LittleBigPlanet 3 comes out, all this content will be free and included! Just like how water was free and included in LBP2! 1. Just got LittleBigPlanet 2 and love it. 2. I would buy this in a heart beat but unfortunately I used the rest of my PSN funds for some LBP costumes. 3. I can’t wait to hear about more LBP Vita details, currently my most anticipated game for the platform. I sttill haven’t tried LittleBigPlanet 2. @MarcusRaven: I’m just pointing the facts. I don’t think that MM are greed, LBP was my first game that the all DLCs from a early game works perfectly on the sequel. But you have to agree with me that fix one bug is much less effort that do this huge DLC, and it is broken for months. Anyway great game, not hating MM, just dissapointed with the lack of response. Dang guys you disappointed me, it’s way too overpriced. Why is all DLC on LBP way overpriced? A lot of the DLC should be free as well. Oh well, I’ll just wait until the Game of the Year Edition comes out to get LBP2 with the Move Pack included and if there are any other DLC I want than that too. OMG! 50% OFF MOVE, NAVIGATION, THE FIGHT AND SHARPSHOOTER (although still overpriced) ON GAMESTOP!?!?!?!? Move and Navigation should have been priced like that to begin with! =) Now, I’m definetly going to get Move, navigation and The FIght! =) Does this mean there’s going to be a new and improve Move and Navigation controllers? Hopefully! and there should be! I will sell these I pick up from Gamestop when the new ones come out! I might now since it’s down to a cheaper price and I just recently got a PS Move. If you do get the Move and nav controller just to play The Fight, I suggest you get 2 Move controllers since you need 2 to actually play it. Just a heads up. I tried playing the demo and I couldn’t since I needed a second Move controller. pls answer does it also come in EU out tonight? Don’t worry. The scoreboard fix is in the works (I just checked). You’ll hear more soon. Update the store so I can buy ($9.99 is a great deal) this instantly! Also, I would love that now the price is $40, please offer it as a digital download on PSN, I will gladly rebuy it just for the a digital version. Do i need this pack to play user created Move levels? Or just to create them? You guys are the best, this is going to open things up on a whole new level. Within 2 months LBP2 will be the best reason to have the move, since there aren’t many unique experiences for it yet. BTW, on the new and improved Move and navigation, have the PS face buttons placement like on the Dualshock, a diamond instead of the current square, because the way it is currently is horrible. Have it so we can play racing games comfortably and nicely with the Move holding it horizontally! Move currently can’t do this! That’s a whole genre Move can’t play. And that we can accelerate, brake, turbo, etc with buttons, not like how Kinect works with Forza 4 that the game accelerates and brakes by itself and you just steer. Even the Wii can do this so come on. Have the PS face buttons pressure sensitive like the Dualshock. Add Move’s motion tech to the navigation controller!!! so we can play games the dumbly require two Move’s and be able to move around!!! Even Wii can do this!!! Lastly, four player Move and navigation offline multiplayer!!! so we can play four player splitscreen FPS’! and remember, motion controls are also family and casual friendly which means the whole family plays which means four players!!! Even the Wii can do this!!! You should try and have Sony do four player Move and navigation so we can play LBP2 with four players, I mean that’s one of the main features of LBP and how it’s funner and meant to be played! You kinda still can play 4 player co-op. The PS3 recognizes 7 wireless controls at one time, so you can do 3 “Move” configurations (Move controller + Nav controller) and one additional DualShock 3 controller. Unfortunately we were limited to 7 controllers. Fun none the less. Kinda last minute on the price info guys. Looks awesome but give us more time to prepare our wallets please. Yeah, that’s stupid, it should bei played using the Move and navigation. But I’ll buy two and when the new and improved Move and navigation (with motion) controllers come out I’ll just sell them or if Sony is dumb and doesn’t do that I’ll still just sell them for the same price I got them or more because I’m not going to get Move until all the things I mentioned earlier are fixed, I’m just going to get them now because they’re $40 for both Move and navigation. Hey, when will we get some more crown and bug blaster codes? This is tempting. So overwhelmed with other PS3 games though. Will there be a LBP2 Move Pack console bundle or Move controller bundle? I think that LBP2 with the Move Pack included would be the best Move bundle to date, as all those user-made levels will give new Move users so much content to play with. They REALLY should release the content that doesn’t require PS Move (the costumes, music, etc…) at a later point, so the people who don’t want to shell out on Move for a one time use can access this huge amount of items. Can us non-Move owners benefit from this DLC as well? In other words can we still play through these levels if we don’t have the Move? Even w/ 50% off Move and accessories from Gamestop, I’m still not compelled enough to make the purchase…not to mention my $1800 tuition I just paid for out of pocket. Fix the insane lag that the new patch made worse and it’ll be a whole lot easier to play these awesome levels. You took too long with the move pack and I had to trade my copy in because I was tired of waiting. When will LBP2 hit the PSN Store? Will LBP2 be having any packs? If I were to buy it now, would it include move updates and etc.? I’d rather wait for one of those. @41 You could have kept the game. You don’t have to trade in a game because it takes a while with an update. That makes absolutely no sense whatsoever for a game that is already fun. That is just plain foolish to think. But with a name that has 420 in it that is to be expected. I really agree with wanting LBP2 on the store. When we got LBP1 through the welcome back thing, i started launching it all the time just because i saw it there in my list, and i already had LBP2! Sorry to ask again, but does anyone know if i can play user made Move levels without this pack? Or is this mostly for creation? I will buy it either way asap but it will probably be a few weeks at least, i’ve got too many games preordered. Final Fantasy fans, I need your support…..Cast your Vote for MOOGLE and CHOCOBO at Gamepost. Their having the All-Time Greatest Game Sidekick comp. and we need to support Moogle and Chocobo. Spread the word guys! To much must have DLC (this, inFAMOUS 2 and Dead Nation) not enough $$$ after I’m through buying new releases. Don’t get me wrong though, this is a awesome price! I was hoping for a $5 update, but any LBP update is an awesome update….Off to the store I go! Thx MM. …this is when I wish PSN would update earlier in the day. Nintendo updates at 12am Eastern on their days (Monday for Wii, Thursday for 3DS). I can feed my kids lunch, then check the various updates. With PSN I gotta wait until their bedtime practically! With a huge update like this one, I wish they’d consider changing the update time. Is there a discount for Plus Members? I’ve still got to get a Move! And God of War Origins and White Knight Chronicles II just came out!